A BS1363 plug socket switched or un-switched has embedded emergency lighting, normal at the bottom of the plug socket. These are low voltage long-lasting light-emitting diodes that will illuminate when the mains electrical supply power to the socket is removed. The plug socket has an internally mounted charging circuit board, this is powered via the plug sockets main 230vac power supply terminals. 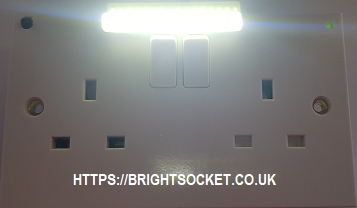 The bright white light emitting diodes used for the emergency lighting is powered via the 3.7V rechargeable battery and only switch on when the power to the socket is lost. All components (excluding 2 gang socket) required to build your own Emergency Safety Socket. The appliance operates similarly to the existing socket until it detects the power is removed when it automatically switches to battery operation and illuminates the bright light emitting diodes.The rechargeable battery enables the light emitting diodes to stay on independently for up to a minimum of three hours or until the electrical power returns.